Hello from beautiful South Africa! I have finally arrived to join my family here in Johannesburg – and not a moment too soon. My journey involved a bus to New York and a night in my friend’s very plush apartment, the subway to JFK and a 14hr flight from JFK to Johannesburg. I arrived on my birthday, and spent most of it asleep!! But it’s wonderful to be here. I’m taking full advantage of my mum’s wonderful cooking, and so I’m not in the kitchen as much as normal – I am hoping to share with you some South African recipes later in my trip, but for now, I thought I’d share a wonderful guest post my friend Ben wrote. I met Ben just over five years ago when we both worked at the Royal College of Music in London. Ben’s a sound engineer, and worked in the College’s studio, along with Avgoustos, Stevie and Seb. Stevie and Seb both joined the staff at the College about the same time as I did, so we all ended up doing our induction sessions together – the sessions were held in the studio, and Seb famously made me a cup of tea when I arrived very hungover for one of the sessions, so I am devoted to him for life. The studio boys became my partners in crime during my time working at the College – a time I think of very fondly. We would go for lunch most weeks, usually on a Wednesday, to the nearby Imperial College bar for what became known as Beer Wednesday – clue’s in the name there. They kept me entertained at work with silly emails – including, famously, a photo of their pants. Ben is also living the expat dream – in Amsterdam with his lovely wife Jenny. We keep in touch via facebook and email, and let each other know what recipes we’ve tried recently! 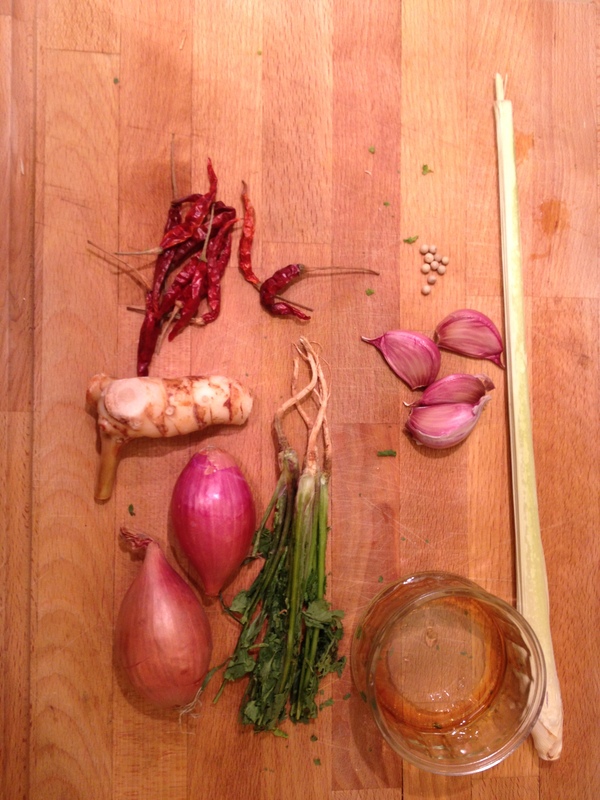 Here is his recipe for Prawn Thai Curry, with a lot of helpful tips from Ben which he’s figured out along the way. I can’t wait to make it! I’ve know Sarah for some time but I had no idea we both shared a love of cooking to the extent that we do. If I’d known we both had this passion I’m sure we would have ventured out together more on the hunt for exciting bites than we did before we both left the UK. Like so many aspiring foodies I’m a food obsessive. I decide I want to master a particular dish and I don’t move on until I’ve achieved this goal. Recently that’s been sourdough breads, salt-caramel ice cream and ﬂavoured foams but the one I want to discuss today is the Thai Curry. I spent my honeymoon in Thailand and completely fell in love with the cuisine. Beautifully simple and elegant, Thai food takes great tasting ingredients and combines them in a way that just work harmoniously, balancing sweet, sour, spicy and salty into something explosive. The last time Sarah and I ate together was at Kaosarn in Brixton, London. Brixton market was not only very close to where we lived but had also been heralded as the new food-mecca in London by the british press. Kaosarn was a new Thai restaurant in the market that was causing a few waves. I don’t think I discussed it with Sarah over dinner but during that time I was on the hunt to ﬁnd the best Thai curry in London. I was fed up of ‘westernised versions’ that just didn’t taste as good as the real thing I remembered eating. Kaosarn was indeed something to talk about and I would tell anyone traveling to London who likes Thai food to go there, however… there was something about sitting outside what is effectively a cafe in February, covered in blankets provided by the restaurant, that just didn’t bring that feeling or the smells of Thailand back. Obviously I wasn’t going to match being in Thailand but but i decided that I’d do away with restaurants on this one and match the taste of a great Thai curry at home. I began doing some research and came across David Thompson as many who have an interest in Thai cooking will have done. His book Thai Food really is the bible on Thai cookery and I have never made anything Thai since without referring to this book. Gone are the ‘cheats’ that I found from websites and famous british chefs. You know the ones, substituting ginger for galangal, limes for kafﬁr limes, fresh chilli for dried long Thai ones etc etc etc. All these things had never produced the authentic result. The following recipe is adapted from that book but to my own taste along with a quick side I thought I’d share as you cannot have a true Thai meal without there being a few dishes. Galangal looks a bit like ginger but tastes completely different. Essential in the curry paste and can be bought in most supermarkets now. Coriander root is another one of those things that get substituted with coriander leaf. This is one of the ingredients I’ve come to realise is the most important within the paste and cannot be missed out not only because if you use the leaf you’ll only ever get a green curry. I have only found this in Asian supermarkets but it’s worth hunting down along with Kafﬁr limes and their leaves. 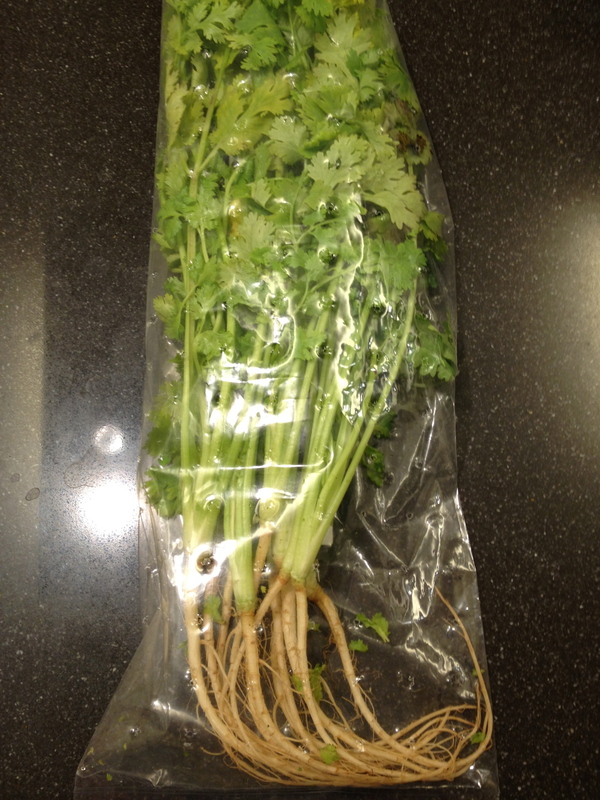 (SP note: to any readers in Boston, I have seen coriander (cilantro) with the root attached in Market Basket. They also stock galangal). The recipe is only really a guide, nothing is set in stone here so just keep tasting and tasting until the balance between the ﬂavours is what you’re after. The paste is the most important part of a Thai curry so it’s worth taking the time to get this right. The end result should be pureed as ﬁnely as possible and smell mellow and rounded as opposed to each individual ingredient coming through. With a view to cooking this curry for friends I have previously made the paste in advance and kept it in the freezer. DO NOT DO THIS! As I discovered the re-thawing process creates an undesired bitter aspect to the curry and completely changes its ﬂavour for the worse. 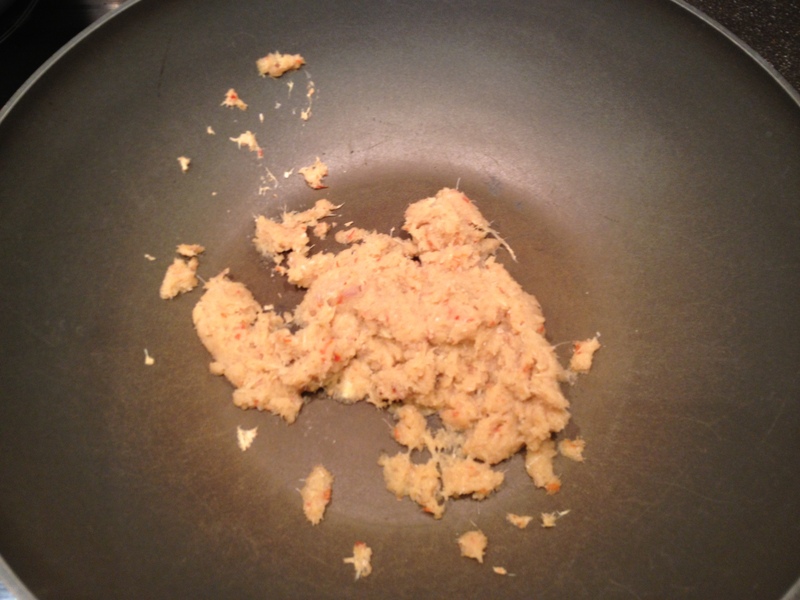 Traditionally the paste is made by gradually adding the ingredients to a pestle and mortar starting with the hardest. This is the way I would always do the paste if I have time as compared to a food processor as you get much more of a ﬂavour and smell coming from the paste. If you are going to process the paste add a little water to help it along. Similarly if you have time, make the coconut cream yourself from a fresh coconut as the end result is far superior to the canned, blocked or any other form of coconut cream you can buy. Ok, ﬁrst add the coconut cream to the pan over medium heat and then the paste, stir regularly and fry for 5mins until fragrant. Season with the ﬁsh sauce and palm sugar. Add coconut milk and simmer until reduced and separated. Add the prawns and half the lime leaves and continue to simmer until the prawns are just cooked. The curry should be salty, a little hot and smell absolutely amazing! Serve with remaining lime leaves, red chilli and coriander. Pile the rice into a steamer evenly spread, place over boiling water and cook for about 30 minutes, check the rice and if tender in the middle it is ready to serve. 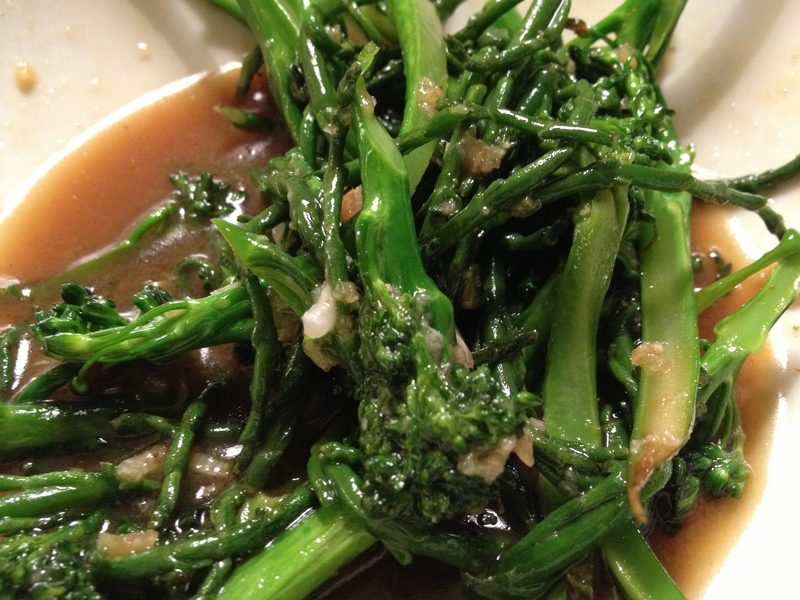 For the samphire pound the garlic and salt together and add it to a hot wok along with the samphire. Stir fry for 3-4 mins until tender then add the water, soy sauce, oyster sauce and sugar and simmer for another minute. Serve with sprinkled white pepper. This also works well with asparagus or sugar snap peas etc.